Remember, this was an OfertaSimple/Groupon deal, and Christine had decided to get me a present of a hydrogen peroxide tooth whitening, one of the “upgrade package” options for the deal. I was indifferent about the whole idea, but she’s the one who has to look at my teeth most often so I agreed to get the procedure done. I’d never had a bleaching done in the states either, I told the dentist to some surprise. “First time then,” she smiled cheerfully at me, and then the gel tube came out. I hadn’t looked up anything about the procedure before coming in. I’d applied whitening strips to my teeth before over the years; I figured the dentist’s procedure was like that, just more sciencey and expensive. I couldn’t tell exactly what she was doing with her fingers 4 inches under my nose, but my nearsight is good enough that I could see the word “gel” on the side of the green tube she had lowered to my face. What the heck would she be doing with that…? Turns out she was applying it to my gums and then drying it with a handheld UV light tool, like what you’d see at a manicurist’s. An effective way to keep the peroxide off of the flesh, I suppose. I was starting to drool around the cotton swabs and plastic lip spreader she’d put into my mouth, so then my old friend vacuum tool came out, was flicked on, and hooked over the lip of the right side of my mouth. Where it would sit, roaring away, for the next 45 minutes. Time seemed to stop, or possibly run backwards and upside down. The little vacuum was perfectly benign and quiet for everyone else. I couldn’t see Christine down by my feet, but the technician and dentist puttered about and chatted, the former coming over every 5 minutes or so to suction out the other side of my mouth that didn’t already have a tube sticking out of it. The vacuum was perfectly quiet for them, but for me it was like having an actual vacuum cleaner sticking out of my face. Things that are allowed to vibrate and make noise while actually contacting your jawbone become extremely loud. And this was not only loud, it was a shrill high pitched and shivering whine. 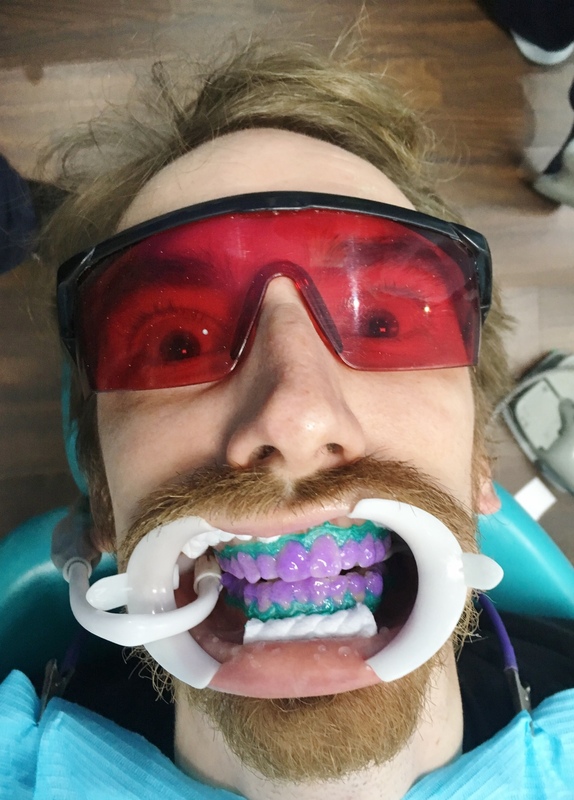 I’ve never used the phrase “I felt like I was going insane,” lightly, but after 45 minutes of having a shrill whine in my bones, combined with the flashes of searing pain stabbing through my enamel, I felt like I was going to pull all the stuff out of my face and run gibbering down the corridor. There was no music I could mentally sing to myself loud enough cut through the noise. When I told Christine about this later, she said “you really didn’t look so bad.” I told her that every 10 minutes or so, I’d wonder if I could ask to have the vacuum removed, but my embarrassment over the possibility of not being understood and my grim determination that if this was how everyone else had the process done, I wouldn’t ask to change the system – stayed my drooling lips. The pain was like a tooth or two was being grabbed with a small pliers and being twisted for a second or two, and then it subsided. After I looked up what the hydrogen peroxide bleaching procedure actually did (something I’m glad I didn’t do beforehand, because otherwise I might have balked and even getting it done all – I’ve never really been a proponent of “pain for cosmetic procedures”) it made sense. My “teeth pores” were opening, draining their water and gobbling up hydrogen peroxide instead. The dentist was very sympathetic and probably assumed that I had known what I was getting into. She wrote me a prescription for sensitive teeth toothpaste (yes, everything that is even slightly uncommon for a health issue requires a prescription in Panama it seems) and threw in some free bottles of desensitizing mouthwash. All and all, it was an interesting experience – and probably not one I’ll do again anytime soon – but the friendliness and care of the dentist and technician were appreciated. If I ever need more dentist work in Panama though, I’ll definitely ask ahead of time if I can control the mouth vacuum and not leave it casually hooked over my mouth and constantly powered on! You fail to mention whether your teeth were whiter after this wonderful-sounding procedure!